Countless hours have been spent in convincing employers to provide safety footwear to prevent the risk of toes being lost, or earmuffs to prevent hearing damage and gloves to prevent cut fingers. The safety industry has also always emphasised the importance of using fall protection equipment to protect workers operating at height. However, it has shrouded the principles of height safety in mystery, and this has not helped the industry grasp a basic understanding of the principles involved in equipment that saves lives. The effects of a fall on a worksite are far-reaching and go beyond the company to the family members and even the community. Most of these injuries and deaths are totally needless because they could be avoided with the right fall protection gear, used the right way. Any person working at a height (i.e. leaving the ground) must be protected. 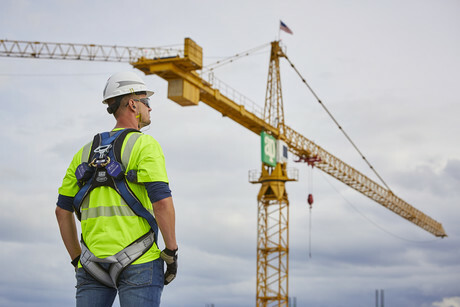 The hierarchy of control, implemented following a risk assessment, demands that the first step is to try and “engineer out” the need to work at height. If this is not possible, the next step is to prevent access to the height safety risk area by the provision of lockout systems, guard rails, etc. Only when these alternatives prove impossible and access to the risk area is required should the last option of the provision of protective equipment be used. Choosing the right equipment to use when working at height can be a difficult job; however, there are six key components that should be considered to protect yourself, and those around you, when working at height: anchorages; body support; connectors; descent/rescue; education; and fall protection for tools. The A, B, C, D, E and F of fall protection cover the fundamental requirements of every personal fall protection system and serve to remind you of the key elements required when working at height. Anchorage provides a secure point of attachment (to an existing structure) for the fall arrest system. Anchorage devices can be permanent or temporary and vary to suit the type of structure available. This can be a fixed point or a static line system, but it must be capable of sustaining a force of 15 kN for a single-person application and 22 kN for a two-person application. Full body harnesses connect the worker to the fall arrest system. They are specially designed to protect the worker against serious injury in the event of a fall, whilst also remaining comfortable to wear. Use only a standards-approved full body harness that is within service, inspected prior to use and correctly fitted and adjusted. Connectors are devices that connect the full body harness to the anchorage system. They can be single products or multiple devices working together. This can be a shock-absorbing lanyard with a maximum working slack of two metres or a self-retracting lifeline (SRL). Education is essential to ensure at-height workers are thoroughly trained to carry out tasks in a safe and efficient manner. Fall protection for tools helps make work environments safer and more productive by reducing dropped object incidents. Finally, and most importantly, never use fall protection equipment without first receiving competency-based training in working at heights and with fall protection equipment. There are many other aspects of fall prevention that must be considered prior to working at height, as incorrect use may lead to severe injury or even death in the most severe circumstances. Our fall protection products deliver the highest standards of protection for workers in the deepest of mines through to the top of the tallest towers. However, on any given shift, workers may potentially put themselves in harm’s way — the importance of selecting the correct equipment, its regular inspection and maintenance and user training are all critical issues requiring further understanding and possibly specialist advice. This article is a general guide, so reach out to a 3M Fall Protection Specialist if you’re unsure of any aspect of fall protection or fall protection equipment. Australia 2017 26 Safe Work Australia, Notifiable Fatalities December 2017 Monthly Report. Australia 2015-2016 6465 Safe Work Australia, Australian Workers’ Compensation Statistics, 2015–16.